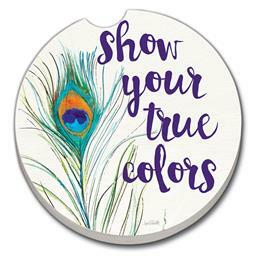 SHOW YOUR TRUE COLORS CAR COASTER. Standard size is designed to fit cup holders in most cars vans boats SUVs and trucks. Durable stoneware construction allows for continuous absorption of condensation. Makes a great gift stocking stuffer or party favor.